One of the downsides of living in a small house is the serious lack of storage. Our place has none whatsoever, and I'm constantly trying to figure out where to put all my tat our belongings, particularly downstairs (I recently wrote about making the most out of a tiny kitchen if, like me, you struggle cooking in a small space and fancy a read). Although it's a three bed, our house has one double bedroom and two much smaller singles. Evie's is the smallest of the two - it has a sloping roof and only just fits a single bed and a chest of drawers in it but she's not desperately worried about the lack of space. I bought her this cabin bed from Wayfair a year or so ago, so that we could make the most of the space underneath it and she's pretty happy with that for now. But with Daisy being a bit older and a bit bigger, and liking different things - like writing and drawing and having friends to play and to stay over - I've been looking at ways to maximise the space in her room. The obvious first choice was to swap her regular single bed for bunks (there's no way we could have chosen a bed with a trundle as there just isn't the floorspace for the second mattress). Having a small house with no spare rooms, bunks would give us an extra bed for visitors as well as being perfect for those all important sleepovers. Continuing my role as a Wayfair Home Expert, we were given the opportunity to review a set and we opted for the Barnese Kids Bunkbeds. They were a really reasonable price (less than £300) which i thought would suit most budgets and I loved the style of the headboards; very smart looking, with straight vertical slats and a slight curve to the horizontal ones. They're made from solid pine and the beds have solid slatted bases so are very durable and sturdy and I can confirm they were super easy to build. The instructions said it was a two man job and would take 2hrs 30 but they actually went up in one hour, and with only one pair of hands too. The girls absolutely love them. 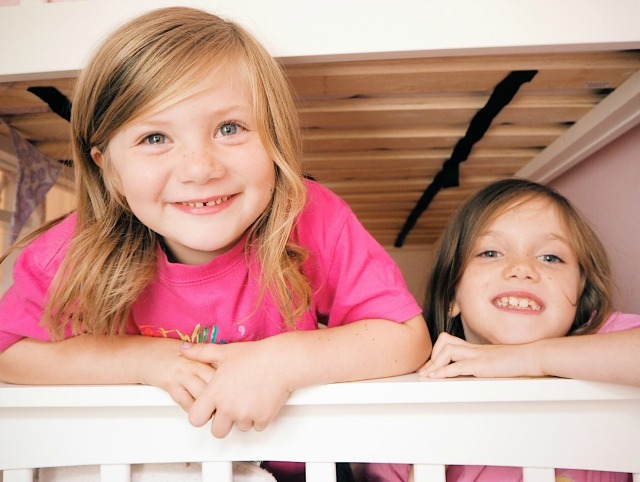 Now they can both sleep on 'the top bunk' - Daisy on her bunkbeds and Evie on her cabin bed - although they do also like to sleep in the same room too, and making a den on the bottom bunk using sheets and duvets has become one of their favourite things to do! As Daisy's bedroom is next on the list to be decorated, Ive been thinking about other ways I can maximise the space in her room. 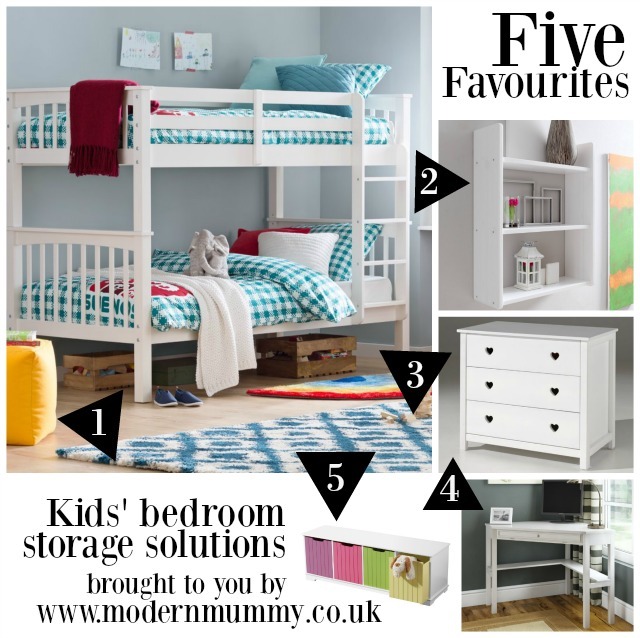 I've come up with these five favourite storage / space saving items, all available from Wayfair. I hope you like them! 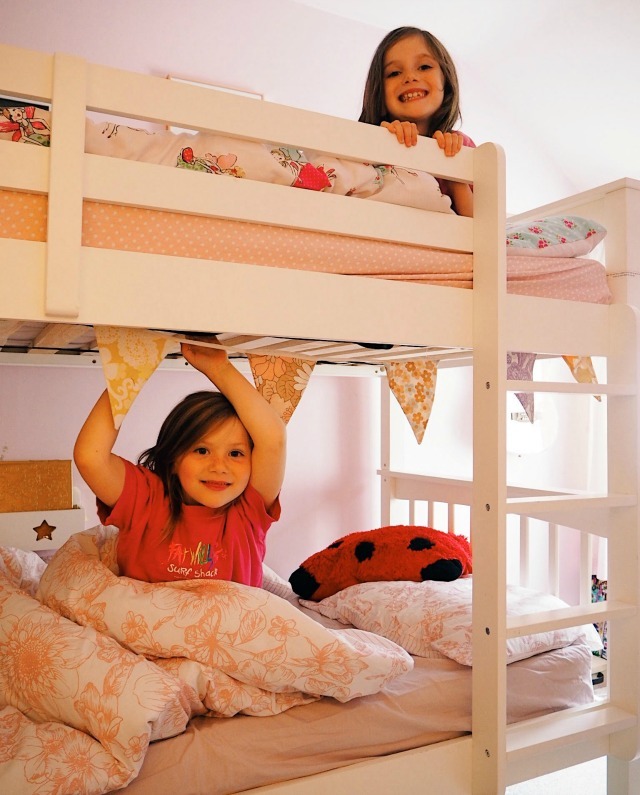 Bunkbeds are the ultimate space saver when it comes to two sharing a room, whether that's siblings or just friends coming over for the occasional sleepover! This is the model we have from Wayfair and the girls and I all love them. They're simple and smart (I'm not a fan of pine or ornate spindles) and were super easy to put together. Hanging wall shelves will save you valuable floorspace - just make sure you get sturdy, good quality ones like these, that can take the weight of plenty of books and ornaments! Large, bulky wardrobes aren't really necessary in a kid's bedroom - the majority of clothes can be folded and put away in drawers. The cut out heart details of this one are gorgeous - plus you could hang a shelving unit above it. Make the most out of a wasted corner by adding a desk. This one is compact, with a pull out keyboard tray and shelves underneath. It could also be used as a dressing table. This is a great and super stylish way to tidy away toys neatly - plus it doubles up as somewhere to sit and read - just add a couple of cosy cushions to the top!